L. Ron Hubbard’s immensely powerful, immensely secretive religion is powered by a workforce of sleep-deprived “ministers.” And that’s not the worst of it. Scientology fought all the way to the U.S. Supreme Court to try — unsuccessfully — to keep DeCrescenzo’s records as an employee and parishioner under wraps. These records tell a story that can seem unreal to someone not familiar with the “Sea Org” and its quasi-naval ranks and uniforms. It’s not just DeCrescenzo. Other former Sea Org workers talk of difficult, arguably abusive working conditions, from swabbing the decks of ocean-going vessels to cleaning toilets with toothbrushes to doing construction without any safety equipment. What those stories all have in common is lack of sleep. As Van Winkle’s reports, there may be no more sleep-deprived workforce in the country than Scientology’s Sea Organization. When she was 13, according to court filings, DeCrescenzo was moved to the “adult” schedule, and found herself working 16 hours a day without a day off. That’s 112 hours a week, or nearly triple the normal work schedule in this country. A photograph of DeCrescenzo in her teens shows her head slumped over as she sits at her desk, asleep on the job. The image captures an essential component of what it’s like to work for Scientology. Now in its 62nd year, the Church of Scientology claims among its ranks many second- and third-generation members. Many brought into the church don’t know any better. And, unless they manage to break free, they may never learn any other lifestyle. But even for those who are “blown” — or, in Scientology lingo, have escaped and disavowed the Church — there’s the issue of recollection. Like DeCrescenzo, Rinder was brought into Scientology as a child and knew nothing else. He finally left the organization in 2007, and he is one of the former members featured in Alex Gibney’s HBO documentary, Going Clear, which won three Emmys for exposing many of the hardships of the Sea Org. Rinder and other former Sea Org members point to sleep deprivation as one of the Church’s most effective methods of control. It’s not hard to understand why it’s effective. A report by the U.S. Senate Select Committee on Intelligence revealed that, following the 9/11 attack, the CIA employed sleep deprivation as one of its “enhanced techniques” that critics have since characterized as torture. Rinder’s roots in Scientology reach back nearly as long as the Church itself. His family joined Scientology after its founder, L. Ron Hubbard, made a visit to Australia in the 1950s. (Hubbard founded Scientology in 1952 and created his first “Church of Scientology” corporation in December 1953 in Camden, NJ.) Hubbard later ended up in England after authorities in the United States had launched various investigations about his movement. In 1967, Hubbard left England and took Scientology to sea. He was joined by a few hundred young and dedicated followers on three ships that came to be known as the Apollo, the Athena and the Diana. For the next eight years, Hubbard ran Scientology from various ports in the Mediterranean and the Atlantic. He dubbed this crew the “Sea Organization,” and members were given naval ranks, with Hubbard himself Commodore. He put them through extreme rituals of discipline, even tossing some wayward crew members overboard. In 1975, Hubbard finally ended his ocean adventure and led a stealthy invasion of the Florida gulf coast town of Clearwater. To this day, Scientology’s Clearwater complex is known as “Flag” — after the Flagship command ship, the Apollo, which Hubbard called home. Those who run it and other Scientology locations are still known as the Sea Org. Outside of Clearwater, one of Scientology’s most important locations is the International Base, also known as simply “Int” or “Gold,” for the Golden Era Productions studios housed there. This 500-acre compound sits in the California desert near Hemet, about 90 miles east of Los Angeles. Only the most dedicated Sea Org members are allowed to work here, and most consider it a badge of honor. This is also where Scientology leader David Miscavige spent most of his time. Miscavige is the most important living figure in Scientology, himself having joined as a teenager and eventually climbing the ladder to work as L. Ron Hubbard’s deputy; he took control of the organization after Hubbard’s death in 1986. It is Miscavige who succeeded in getting Scientology tax-exempt status in 1993. Miscavige also had a habit of disregarding Sea Org members’ need for rest. “It was common for Miscavige to come into our office and have a conversation with him while someone was sleeping in a fetal position on the floor with their coat rolled up under their head,” said Marc Headley, who also grew up in Scientology. Headley worked at the Int Base for 15 years before making a mad dash for freedom, which he described in his 2009 book, Blown for Good. “One time, I had a conversation with Miscavige, and the brand name of the tape machine I’d been using was imprinted on my face because I’d fallen asleep on it,” he said. Miscavige himself, Headley pointed out, would work until three or four in the morning — but he slept in until about noon. Sea Org workers like Headley didn’t give any thought to that discrepancy. He had a job to do, no matter the unrealistic demands put upon his schedule. “The secret to sleep deprivation is cat naps,” he said, laughing. One incident wasn’t so funny. Headley and other workers were assigned to work with recording machines that manufactured audiotapes of Hubbard lectures. When a master tape was ready, they made duplicates on various machines. If a new master wasn’t ready, they had a chance to take a short break and maybe a quick nap. The guy who handled the master tapes wasn’t so lucky. He simply never took a break, even for a short while, as the others waited for him to make their duplicates. “The guy’s record for staying up was seven days straight,” Headley said. And then one day, he disappeared. “The first day, we assumed he’d blown,” Headley said, using the term for escaped. As with other organizations that inspire blind, exhausting devotion among its members, Scientology employs another tactic to keep its Sea Org members motivated: fear. It wasn’t just on-site duties that ate away at the members’ sleep schedules. Alex Gibney and HBO anointed as the poster boy for their new film an admitted liar who was expelled from the Church, Mike Rinder. It’s accurate to say he dreams up new myths and lies given he’s usually asleep. Rip Van Rinder has perfected the art of nodding off and laziness. His former colleagues tell stories of his Rinder falling asleep anytime, anywhere. And no, it’s not because of any medical condition. He readily admits he doesn’t like to work. So when it comes to Mike Rinder and his lies, one must always go in with eyes wide open. Even if Mike Rinder can’t. Portraying former Scientologists as incompetent is one of the Church’s common tactics. What makes the Rinder case so unusual, and compelling, is that he was Scientology’s top spokesman for about 18 years. He knows how the organization works. “The control mechanism in the Sea Org is urgency. And it’s a phony urgency that somehow what we get done will have some impact on the world,” he said. Marc Headley decided to flee Int Base on January 5, 2005. He had to keep his plans a secret, even from his wife, Claire. “He radioed me with his Nextel phone and asked if I was coming home,” Claire recalled. The couple lived in an apartment on the base, which they got to use very little. She told Marc that she was going to try to get home, but she was still working. “I knew the drill,” Claire said. She had to make the other workers believe that she’d had nothing to do with Marc’s escape, and that she was now turning her back on her husband. She also went into extreme sleep deprivation. “I knew that sleeping an hour or so a night reduced my chances of being ‘sec checked,’” she said, referring to the brutal security interrogations of those suspected of working against the Church. Before long, Claire made her own escape and was reunited with Marc, and they then set about doing what they weren’t allowed to do in the Sea Org: have a family. They now live in Colorado with their three young boys. And that’s where the most insidious of Scientology policies enters the picture: From the early 1980s or mid-1990s, depending on which source you consult, it was against policy for Sea Org workers to have children. This held true until about 2010, when the Tampa Bay Times first exposed the practice of church officials pressuring pregnant Sea Org women to get abortions. Sleep deprivation, say former members Gary Morehead and Gary Weber, was central to enforcing this policy. For the record, Scientology has denied coercing abortion among its members. But in 2010, a spokesman, Tommy Davis, did admit to the Tampa Bay Times that there had been a longtime policy against having children in the Sea Org. Another former member who makes this claim is Laura DeCrescenzo, the New Mexico woman whose abuse trial is scheduled for December 7. When Laura was 16, she married another Sea Org worker. At 17, Laura got pregnant. In her court depositions, she testified that was told an abortion would be “the greatest good for the greatest number of dynamics,” a Scientology slogan used to assure loyalty to the group. 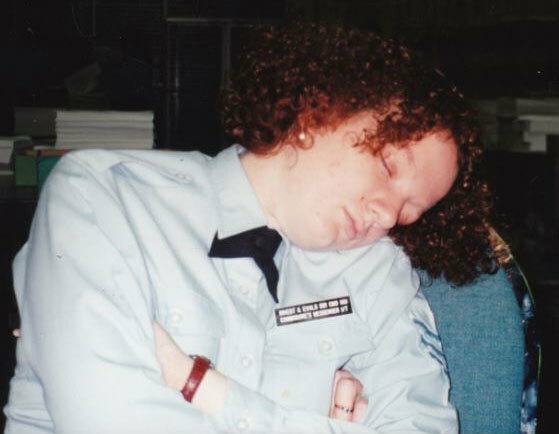 Morehead and another former Sea Org employee, Gary Weber, make it clear that extreme sleep deprivation contributed to their subjects’ malleability. Laura DeCrescenzo’s lawsuit has traveled a very complex road to trial, and it’s not there yet. A new hurdle was recently thrown in its path. Last month, Church of Scientology lawyers filed another motion for summary judgment; a previous motion was dismissed in 2013. This time, the Church has asked the court to dismiss DeCrescenzo’s lawsuit because it is a church and its treatment of Sea Org workers — however perceived by the outside world — is protected under the religious freedom guaranteed in the First Amendment. This strategy has worked for Scientology in the past. It’s entirely possible that DeCrescenzo’s case may never see a courtroom. A request for comment about the Sea Org’s extreme work hours and the claims of coerced abortion was sent to the church. No reply was received by press time. We will update this article if we receive any comment from the Church of Scientology. This story originally appeared at Van Winkle’s. The author, Tony Ortega, was previously the Executive Editor at Raw Story.